Milorganite can be stored indefinitely in a dry place. To remember when to fertilize in the north and south we recommend using the “holiday schedule.” The specific holidays when you fertilize will depend on whether you have northern (cool) season grass or southern (warm) season grass. Check out the tables below for recommendations on when to fertilize with Milorganite and how much to use based on your type of grass. Make sure to use the correct spreader setting or calibrate your own spreader. It's not necessary to water in Milorganite after application, which is one of its great features. It stays on the soil until water and temperature conditions are just right for soil microbes to break down the nutrients in Milorganite for plants to use. Although not necessary, watering in Milorganite will ensure the fertilizer is in contact with the soil and speeds up the fertilization process. If you’re overseeding your lawn, mix the grass seed with Milorganite. It’s an effective way to spread seed and fertilize at the same time. Mix 4 parts Milorganite with 1 part seed by weight according to recommended overseeding application rates. Northern Grasses such as Kentucky bluegrass, Fescue, and Perennial Ryegrass should be fertilized four (4) times per year. 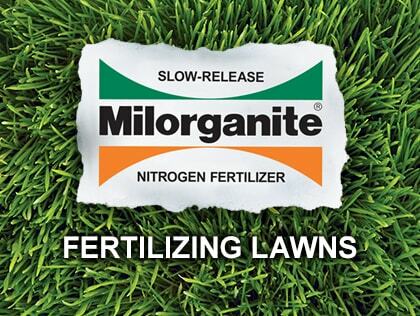 In spring, fertilize your lawn with Milorganite after the last frost and once your lawn begins to grow and green. A good rule of thumb is when daytime temperatures are consistently in the 60s which means soil temperatures are in the mid-50s. Check out this online tool to learn your current soil temperature. If you fertilize too early, the plant will focus on shoot growth and you will sacrifice root growth. Deep roots help your lawn better withstand drought conditions during summer months. For the last application, fertilize with Milorganite as late in the season as possible—just before the first deep freeze or snowfall. This fertilizer application, known as “dormant feeding,” encourages healthier, greener lawn in spring. MD & MI: Apply Milorganite two times per year at the rate of 32 lbs per 5,200 sq ft (per state regulations). Check with local ordinances for fertilizer blackout dates. Southern Grasses, such as Bermuda, St. Augustine, Centipedegrass, Bahia, and Zoysia, should be fertilized four (4) times per year. Centipedegrass and Bahia grass prefer spring and summer feedings, and to help prevent winterkill, avoid fertilizing these varieties in the fall. In spring, fertilize your lawn with Milorganite after the last frost and once your lawn begins to grow and green. A good rule of thumb is when daytime temperatures are consistently in the 70s which means soil temperatures are in the 60s. Check out this tool to learn your current soil temperature. If you fertilize too early, the plant will focus on shoot growth and you will sacrifice root growth. Deep roots help your lawn better withstand drought conditions during summer months. Avoid fertilizing southern grasses too late in the fall. The grass is trying to go dormant and when you fertilize you’re encouraging it to grow. This may cause your lawn to be less hardy as it enters cold weather and more susceptible to winter injury. The last time to fertilize, warm-season grasses, in fall is one month before dormancy or the average first killing frost. FL & MD: Apply Milorganite two times per year at the rate of 32lbs per 5,200 sq ft (per state regulations). Check with local ordinances for fertilizer blackout dates. *In regions where killing frosts can be expected, avoid fertilizing southern grasses in the fall less than one month prior to the average date of the first killing frost. For best results, fertilize when overseeding. Mix Milorganite into the top two inches of soil before seeding or sodding. After you mow the lawn for the third time, apply two 32 lb bag per 2,500 sq ft of lawn, then follow the recommended fertilizing schedule for your grass type (see above). VA apply 32 lbs per 2,500 sq ft. Rates not applicable in the state of FL. For help with setting your spreader, visit spreader settings.